Tying a boat to the Bull Rail on a dock is a commonly required docking skill that is often done the hard way. Many docks don’t have cleats, the cleats are not in a convenient location or a cleat might already be full. Not being able to quickly tie a boat to a dock that has a Bull Rail can put your crew at risk for injury as they struggle with the dock lines. If your crew has to struggle to get a line undone when you leave the dock your boat or crew can also be at risk for damage or injury. 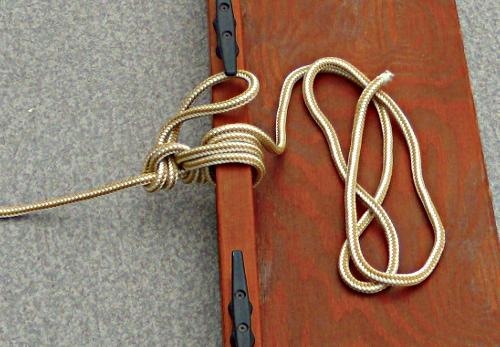 Here are a few tips and tricks to make tying your boat to a dock that has a Bull Rail safer and easier. Pass the dock line coming from the boat under the Bull Rail on the dock, this will have the line over the Bull Rail if it is led back to the boat. If the dock line from the boat goes over the Bull Rail the dock line will wrap around the Bull Rail when the line is being released and will probably jam, the crew will then need to struggle to free it. If the line starts under the Bull Rail on the dock it is easier to feed the line back to the boat. Feed the mooring line under the Bull Rail on the dock and over the Bull Rail and back to the boat when possible, your crew can then cast off the mooring lines without leaving the boat or doing the “Leap of Death” to get back on board. A Round Turn and Two Half Hitches works well to secure a dock line to a Bull Rail. The Round Turn and Two Half Hitches is secure and is quick to tie. The Round Turn also helps to control a loaded line and will help keep the line under control and not pull your crews hands into the Bull Rail if the mooring line has a lot of strain on it. 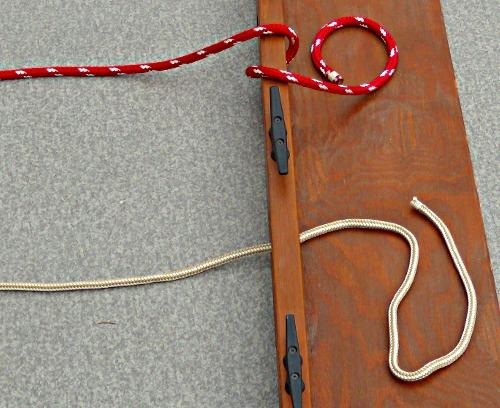 If the dock lines are tied to the Bull Rail with a Round Turn and Two Half Hitches, untie the knot and send the dock line back to the boat with just a single turn around the Bull Rail when you are ready to leave the dock, then the crew can board the boat and release the dock lines from the boat. Once in a while tying to a dock, there is one of me and many dock lines coming at me, I will take the line over the rail from the boat and pass it back under the Bull Rail and secure it with two Half Hitches. I will go back and change the dock line to lead under the Bull Rail from the boat when the boat is secured and things have calmed down. Start by passing the line from your boat UNDER the Bull Rail on the dock. Leading the dock line around the Bull Rail on the dock and back to a cleat on your boat will make it easier when you leave the dock. When the dock line starts under the Bull Rail – the dock line can be thrown onto the dock and the line should feed back nicely to the boat, the crew can release the dock line from the boat. By passing the line under the Bull Rail you can throw the dock line back onto the dock and the line will slide under the Bull Rail. The top line was passed OVER the Bull Rail and when the bitter end of the dock line is sent back to the dock it wraps around the Bull Rail and jams, preventing leaving the dock or requiring more work for the crew. 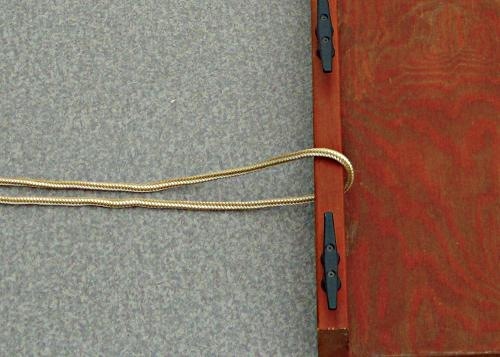 A Round Turn and Two Half Hitches is a secure way to tie to a Bull Rail. If the dock line does not have a lot of stress on it many people use just a turn around the Bull Rail with Two Half Hitches. If the dock line is long, middle the line (double it up close to the Bull Rail) so you don’t need to feed the full length of the dock line around the Bull Rail and through the knots. Yes middling the line gives a bit of a hand full of line but is much easier than dealing with the full length of the dock line. 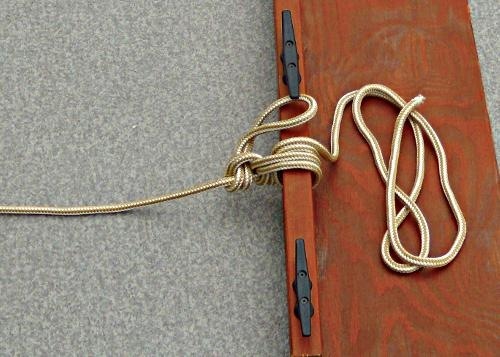 I hope these tips help make tying your boat to the dock easier and safer. Please see How to Tie Your Boat to a Bull Rail – Part 2 for more ways to tie your boat to a Bull Rail. 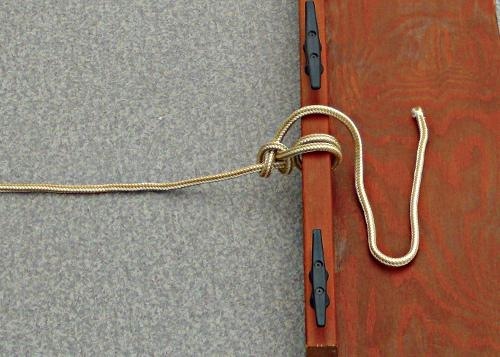 Please see How to Tie a Cleat for more information and instructions on tying a cleat. A Round Turn and Two Half Hitches is is the knot most people use when tying to a Bull Rail. 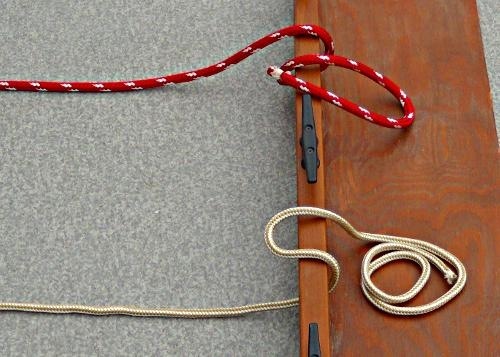 This entry was posted in Boating Safety, Sailing and Boating Skills and tagged boating knots, marlinespike seamanship, marlinespike skills, mooring tips, mooring your boat, Tying Your Boat to the Dock. Bookmark the permalink. Thanks Capt Mike! You’re always helpful! I appreciate your article and I like the fact that you not only include a great description but that you have very good pics to go along with your descriptions…very helpful indeed! Thank you for the Bull Rail education. Used it on my last outing with easy success. Nice to finally abandon the dreadful granny knot when I encountered a bull rail. Thanks again.